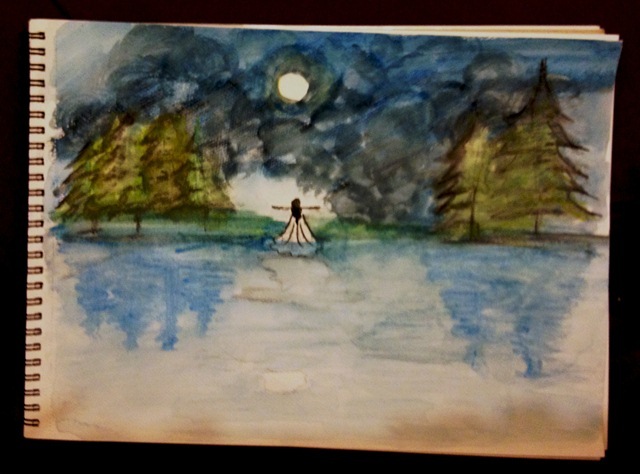 Part of my 2012 bucket list is to paint because for so many years, I’ve been telling myself that I’ll paint. I draw and sketch, but never have I painted. Whenever I come across a painter, amateur or professional, my line would always be “teach me how to paint!” and always I’d get this look on their face that says, ok, how am I supposed to do that? One thing I picked up from this new painting hobby is that, if you want to do something, just start doing it–no fireworks, no drama. 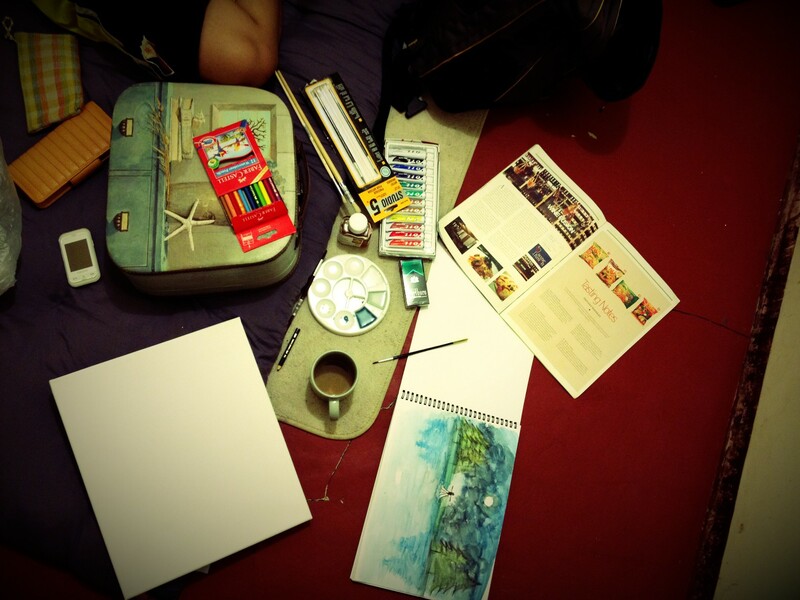 My first time happened after a simple commonsense step: I bought a canvas, a set of brushes, oil paint, and watercolor pencils. Mike is also into anything Art, so he bought his own set. Once we got home, I ripped open the watercolor pencils and draw Mt. Makiling, some leaves, and flowers, then later on, I painted something I always sketch–a woman and the moon. Suddenly scared of the loony and melancholic pictures I’m painting, I cleaned my brushes for another work. Satisfied with the pencil watercolor experience, I turned to oil. Our friend Kate helped us shopping for painting materials and she advised us to use turpentine when painting with oil. The first problem one inexperienced “painter” would encounter, I think, is what to paint. This is so much like the writer’s block: faced with a blank canvas, the artist can stare at nothingness for a long time, and so as in facing one’s writer’s block, the necessary step is to just [write] puncture a paint tube, spill it on a pan, dip the brush, and apply it on the canvas. 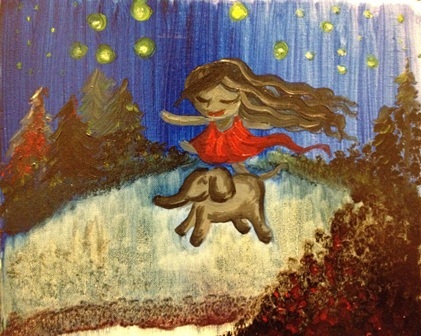 My first oil on canvas is a girl riding an elephant. The first animal I learned to draw well is the elephant. I was 6 years old, in prep school, and I remember the pleasure of drawing something seemingly difficult. Elephants seemed so complex to represent on paper, but once captured, it’s as if other huge challenges in drawing can be overcome. Drawing an elephant, for me, meant championing a big fear of the unknown. After painting it, I was relieved, thinking, so that’s painting; I think I can do more. If reading enhances one’s writing skills, perhaps looking at other paintings and artworks could do some miracles to our jellybean talents. Oh. What a terrible memory. Of course, turpentine to wash em, linseed to smell while painting. hehe how can i forget linseed oil! Thanks, Kate, will see your sunsets soon then! uy! hi papa doms! haha i dont remember my drawings in grade 3… [keeps on thinking, frustrated] but yeah! i remember drawing that time! salamat for reminding me.